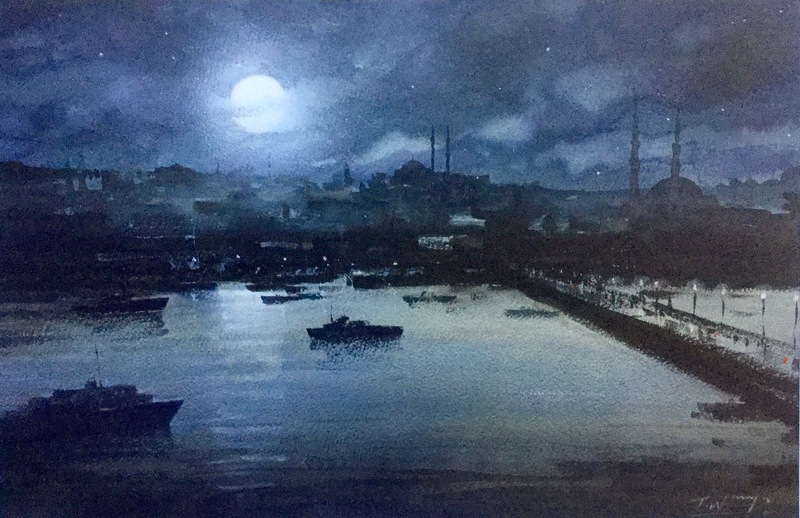 A nocturne of Moonlight in Istanbul. The Galata bridge in sight and a cloud scape gradually appearing to partly obscure the Moon. This watercolour is a dramatic, atmospheric yet sensitive in it’s rendering and application of subtle colours. ” I wanted to convey the mystery of the place ” says Trevor. The city is silent and asleep and Trevor conveys the silence of an urban landscape by his use of tonal disposition and limited colour. The river traffic glides quietly and effortlessly through the cityscape under the light of a full moon. This is essentially a generic yet iconic work of art.